In what I feel certain will come to be known as the year of fictional dystopia, Steven Polansky's debut is on e of several bright spots. I’m a man who doesn't matter. The same could be said of most men. In what follows, I will make no special claim for myself, save one, for which I can take no credit. This report will not, finally, be about me. I speak carefully here, and with regret, though not, such is my understanding of the world and its disenchanting ways, with incapacitating regret. 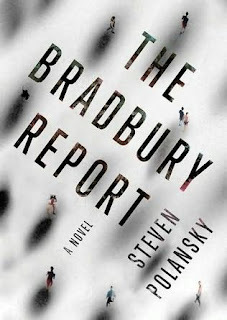 Some critics have said that the science of The Bradbury Report (Weinstein Books) is thin. I didn’t experience that myself but, if I did, it wouldn’t matter: that’s not Polansky’s point. This is a story of terrible possibilities and outcomes -- both expected and unexpected -- due entirely from human machinations. It is 2071 and the government has put in place a large scale cloning program that impacts directly on the population’s insurance of health. Every American citizen has a cloned copy that lives in a different part of the country. The clones are kept absolutely separate from the general populations and the people that they duplicate. Until one of them escapes. Lincoln Cho is a freelance writer and editor. He lives in the Chicago area where he works in the high tech industry. He is currently working on a his first novel, a science fiction thriller set in the world of telecommunications.